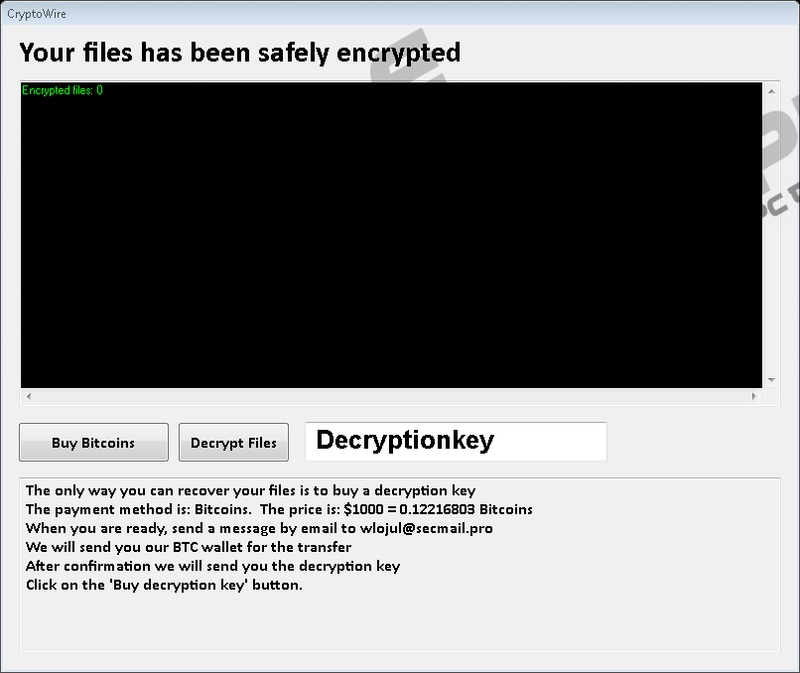 Malware experts working at our internal labs have discovered yet another ransomware application, which goes by the name of wlojul@secmail.pro Ransomware. The malware in questions is currently roaming the web, which means that you must be aware of its existence at all times. If you are not familiar with applications of this category, it is crucial to note that they are designed to encrypt vast quantities of data without requiring any authorization. As a consequence of having this malware active on your PC, quite a few of your applications will no longer function. To educate yourself about this malicious program's functionality, be sure to read the rest of this report. Besides such information we present a few virtual security recommendations, which will help you maintain a clean and safe operating system at all times. To help you delete wlojul@secmail.pro Ransomware, we include a comprehensive removal guide, which you can find below. Since there are tons of ransomware programs roaming the web these days, it is quite natural that most of them function in a relatively similar manner. Wlojul@secmail.pro Ransomware is not an exception. Once it enters your operating system, it immediately starts doing its dirty work. Unfortunately, this malicious application blindsides most users because it works silently and quickly. First, it determines the contents of your hard drive. Right after that, this ransomware starts the encryption procedure, which is over in a matter of minutes. During encryption, it locks your data with a powerful algorithm, which means that manual decryption is not a viable option to regain access to the affected files. As mentioned, quite a few of your programs will cease to work because data needed for their functionality will be inaccessible. Also, this malicious piece of software issues a list of files that it has affected. Besides all of that, you will notice a ransom note on your desktop. It informs you that your data is no longer accessible and that you must pay a ransom in return for decryption services. You are urged to pay $1000 using Bitcoin. Even though it might seem like a way to restore your data, it is crucial to note that developers' of this malware are not obligated legally to unlock the affected files. It should be self-evident that you must remove wlojul@secmail.pro Ransomware as soon as it is found up and running on your PC. Use the instructions below to terminate it without encountering any major problems. If you consider yourself to be a security-conscious user, who wants to have a clean and secure operating system, you need to take a few precautionary steps. It is essential to note the benefits of safe browsing habits. By refraining from all unauthorized download sites, you will significantly lower the risk of encountering bundled installers. Make sure to obtain all of your software from its official developers' websites only. Likewise, you should bypass all emails and email attachments that come your way from unknown third-parties. Our researchers recommend doing so because malware developers are known to use spam email campaigns for distributions services. Furthermore, you must find out as much as you can about any application that you want to have up and running on your operating system because malware developers tend to use misleading marketing tactics to trick naive Internet users into downloading their devious programs without knowing what they do. Finally, and most importantly, be sure to install a reliable antimalware tool if you do not have one already. Such a tool is paramount because it is designed to identify and remove any virtual security threat automatically. By taking these preventative measures, you will make your operating system virtually unbreakable. Remove wlojul@secmail.pro Ransomware without any hesitation. Do so by using the instructions that we present below. Be sure to execute each step with precision, and keep in mind that a single mistake could result in an incomplete removal. If that happens, you might have to face undesirable outcomes. For instance, just a few traces of this invasive application could be enough for it to continue working. In other situations, those leftovers might trigger a restoration procedure of wlojul@secmail.pro Ransomware. If you wish to be sure that the removal process has been successful, you need to double-check your entire operating system as soon as you are done with the instructions below. If you find such analysis a bit too complicated, you can scan your operating system as a whole with a professional antimalware tool since it can identify and remove anything associated with wlojul@secmail.pro Ransomware automatically. Right-click the malicious .exe file and select Delete. Note that the name of this file is random. Quick & tested solution for wlojul@secmail.pro Ransomware removal.